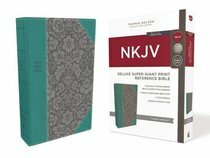 About "NKJV Deluxe Reference Bible Super Giant Print Blue (Red Letter Edition)"
Thanks to the exclusive Thomas Nelson NKJV Comfort Print® typeface in the largest format available-super giant print-your eyes will discover a smooth reading experience allowing deeper engagement in God's Word. But with the NKJV Super Giant Print Deluxe Reference Bible, you won't have to sacrifice study features for readability. A complete cross-reference system, book introductions, a concordance, and full-color maps make this the go-to Bible you'll look forward to reading.